Mr Choe Peng Sum has overall charge of the business performance and global expansion of a chain of serviced residences, hotel residences and boutique hotels worldwide. Mr Choe stewarded the company from its inception in 1996 with two properties and 400 keys in Singapore, to currently owning and managing 148 properties across more than 80 cities globally with a total of over 23,600 keys. Today, Frasers Hospitality Group Pte Ltd is regarded as the top three global extended stay hospitality operators. Mr Choe graduated from Cornell University (Ithaca, New York) with a Bachelor of Science with Distinction. 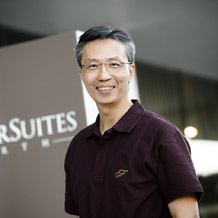 He started his career with Westin and subsequently Shangri-La International in 1981, where he was awarded the Shangri-La overseas scholarship.